My daughter is only two years younger than my son so when it comes to baby toys we thought we were covered. However, that never keeps me from looking or shopping for new and/or better items to help her development. I was excited to find SmartNoggin! SmartNoggin specializes in helping babies reach important development milestones and their NogginRings and NogginStick are perfect for my daughter. 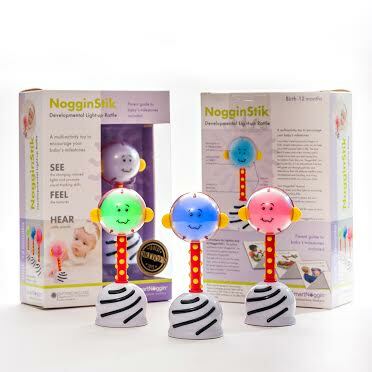 The NogginStick is a developmental light-up rattle that my daughter loves to look at and play with. The NogginStick has a head that lights up when my daughter bats at it with her hand, which is a great way to help children learn to reach and hit toys. The red, blue and green lights help stimulate her eyes and encourage visual tracking. The base of the NogginStick doubles as a soft rattle, which is easy to hold for my daughter to learn grasping. I love that it has different textures for her to feel. As my daughter learns to hold the NogginStick and transfer the rattle from hand to hand, she is able to find herself at the other end in the small mirror to keep her laughing. 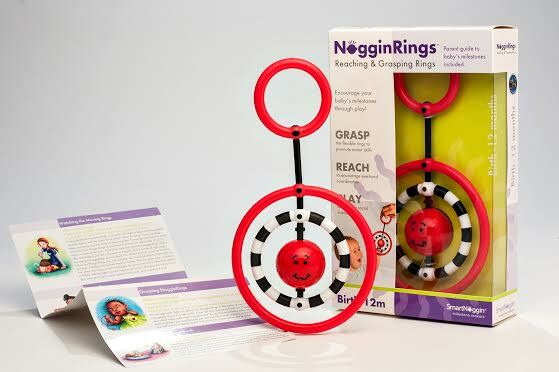 Equally impressive is the NogginRings, which also helps with reaching, grasping, tracking and transferring. I attached the rings to my daughter’s mat and car seat to keep her entertained when I’m not able to. My little gal had other toys to play with, but they didn’t entertain quite as well. I love that the NogginRings offers such a great mental stimulation as well as helps with so many developmental skills and is not just a distraction like other toys. The rings are a soft rattle that she loves batting and shaking. The vibrant colors grab her attention. As she gets older, I know it helps her to use both hands to play. I feel much better about the times I put her in her seats, knowing that she is still getting some mental benefits. 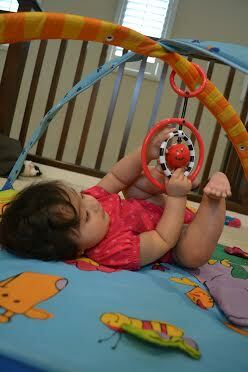 The SmartNoggin toys are great for such an important time of mental and physical development. They come with a helpful milestone guide that provides different stages that babies should be achieving and how to use the toys to achieve that. I love how well thought out these toys are that they can truly help development the first year and through all the stages. It is well worth the price when you only need to have one toy to replace what several toys did individually. I’m not surprised why SmartNoggin is the recipient of so many awards and highly recommend it as a parent of a little one. 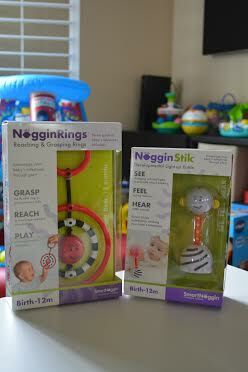 One Winner will Receive a NogginStik Developmental Light Up Rattle and NogginRings Reaching and Grasping Rings! We will love the bright colors and the black and white contrasting patterns. This will be a Gift for my Nieces Baby that will soon to be born, I think that he will like the Rattle and that it lights up. The rattling and that it lights up! I think my little one will like the rattling sounds! Too bad I don't live in the US. ~Those are so cute and cheerful looking! My little guy would love that they both rattle, and he'd love that the nogginstik lights up! I love that they are colorful and that they light up. I think she will love that the rattle lights up! My baby would love the lights! I think our little guy would really like the textures. They are so cute. She would love them all. My little niece would be attracted to the bright colors, the lights and the rattle sound. The mirror on the bottom is a nice bonus for her to discover. Love that it has different textures!